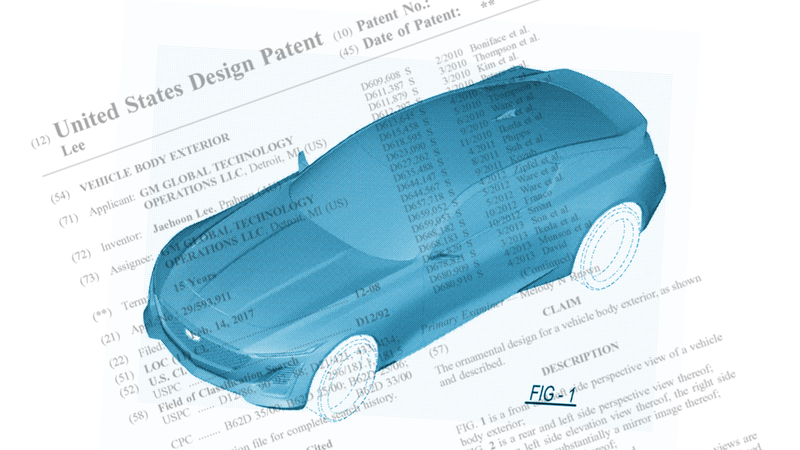 A design patent granted on July 3 to GM Global Technology Operations for a “VEHICLE BODY EXTERIOR” shows images of an athletic, sleek-looking coupe that many believe will be the all-new Cadillac CT5 Coupe. While we’re not certain of that, it is an interesting design that will give Cadillac a type of sporty car it’s been missing. The drawings were first brought to our attention by the site Cadillac Society. Right now, Cadillac’s only coupe is the ATS coupe, which is a nice “personal luxury” coupe but not really a sports car like the old XLR was. But as we all know, Cadillac is in the process of overhauling its entire lineup to be “CT” cars or “XT” crossovers, followed by a number, so this appears to be the new midsize coupe. And where the XLR was based on the Corvette, this new design’s proportions look like it could be based on the Camaro, which would be a smart move, re-purposing an already developed platform that has the performance needed, with larger and more flexible interior packaging than, say, a Corvette-based product. Or maybe it will be the Omega platform, which underpins the CT6 large sedan. Anyway, the design looks good, at least from what we can tell from these early CG grayscale renderings. It’s got classic long hood/short deck proportions and a nice fastback roofline. Even more interesting, the visible cutlines seem to suggest a rear hatchback design, which would be a first for a (non-SUV) Cadillac. The front end design shows a sort of simplified, cleaner approach than Cadillac has taken in the past few years, and I’m wondering if that rectangular panel in the grille is for radar/cameras/SuperCruise sensors? The rear has four exhausts and what look like taillights that are almost right angles. From above, there’s a slight Coke-bottle curve in there, but it’s mostly a rectangle with blunted corners. It’s a good design, I think. Maybe it’ll be the new CT5? Maybe it’ll be based on a Camaro? Maybe it’ll be the first car for a China-only re-birth of the Buick Riviera as a sub-brand? I guess we’ll just see.